When The Baron and I first started dating, I was really interested in learning about his particular tastes in ethnic cuisine. It was a relief knowing he was open to trying different cuisines because some Asian cuisines can be pretty exotic. Thankfully Indian cuisine was one he enjoyed. Continuing on my Asian taste tour this week, we're taking a stop in Indian for these Tandoori Chicken Wings. Chicken is marinated in a seasoned yogurt mixture packed with spices, then baked in the oven. It's a delicious and flavorful spin on chicken wings and makes for a great appetizer too. I love a good chicken wing recipe and this was a nice change of pace of the usual flavors and sauces. Instead of a sauce to dip the wings in, this recipe involves marinating the wings in a spice packed yogurt sauce. It's adapted from a recipe for traditional tandoori chicken and who says you have to only use chicken pieces? Wings are just as good! If you must dip wings into something, I would recommend just some yogurt or even (as odd as it sounds), Greek tzaziki sauce because cucumber and yogurt compliments the spice marinade really well. 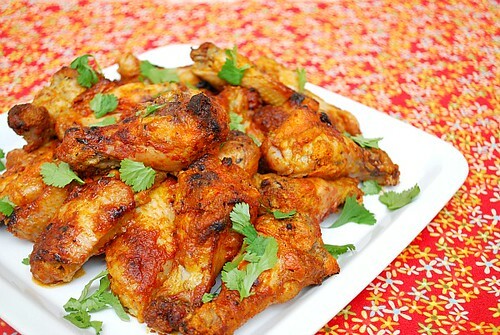 Place the chicken wings in a gallon sized storage bag or nonreactive large, shallow dish. In a nonreactive bowl, combine the yogurt, lemon juice or vinegar, garlic, ginger, cumin, ground coriander, cayenne pepper, cardamom, cloves, black pepper and salt. Stir until well-mixed, then pour the mixture over the chicken and rub it in, tossing to completely coat the chicken wings. Seal the bag or cover the dish and refrigerate 8 hours or overnight, up to 2 days. Remove the chicken from the refrigerator at least 30 minutes before cooking. Remove the chicken from the marinade, removing any excess marinade, and brush with oil. Preheat the oven to 450 degrees. Place the chicken on a baking sheet, brush with oil, and roast, turning once, 25 to 30 minutes until the juices run clear when a piece is pierced near the bone with a knife. I adore Indian cuisine! And I love when you try out the recipes first so I know I can count on them! I love chicken wings. This new flavor pairing has me wanting them, NOW! Instead of tzatziki sauce, you can make an Indian raita or a cilantro and mint chutney as dipping sauces. Even some plain yogurt with roasted cumin powder and salt is fine. Thanks a lot for this recipe. It turned out great.delicious dear...You have made this perfectly..Will surely give it a try..